Hi, I’m Katie, I’m 15 and in Year 10 at St Christopher’s CE High School. I have been doing a work experience placement here at Mid Pennine Arts for two weeks. I didn’t know very much about the organisation before I arrived, so this is all very new to me. MPA is in the middle of compiling a digital archive, to celebrate their 50 year anniversary and I am very pleased that I have been involved in this process. Whilst looking through images, brochures, leaflets and posters I found some things that I found particularly interesting and wanted to investigate further. Throughout my time here, I have been doing just that and I would like to share some of my findings with you here on this blog. I’ve been dancing and performing since I was three, so naturally many of the projects and events that stood out for me were about dance and theatre. I’ve tried to pick a few projects from each decade, so that you can get a sense of how MPA has developed but also because I wanted to explore the early years of the company. In the 1970’s The Mid Pennine Association for the Arts set up a travelling theatre company called TheatreMobile. The company travelled around the Mid Pennine area performing shows, plays and pantomimes in a range of venues for all different age groups. One thing that struck me about the performances was how little it cost to go and see them – I think the most expensive that I found was on ly 60p! Today you struggle to buy anything for that price and to see a performance of the same nature would be far more expensive. I decided to do some research about prices in the 70’s and I’ve discovered it cost only five pence for a pint of milk and nine pence for a loaf of bread; 20 cigarettes would only set you back 30p and you could buy a Mini for only £600! Something else I have discovered from an old newspaper article is that the early shows were done with five actors, no lights and a £50 budget, which again is quite amazing. I came across another press cutting, talking about how actors from TheatreMobile had been to visit and entertain children who had to spend Christmas in hospital; MPA is all about bringing people and communities together and I think this really shows that the ethos has always been this way. Also when looking through projects from the 70’s, I discovered the Northern Dance Theatre, who were the only regional ballet company. They toured around the area performing their latest ballet each season, the earliest documentation I can find of this is in September 1970. What really stood out to me was their photos and how exquisite they looked in them, and as I do ballet myself I can truly appreciate how hard they must have worked. It seems that the Mid Pennine area loved them too, because they made numerous appearances throughout the 1970’s. I n the 1980’s, a dance company called the Lynx Dance Company came to visit the Mid Pennine area, they were a contemporary company, who focused heavily on getting dance into schools. I found this interesting because today there still isn’t much dance in schools and I think it’s a really important and valuable thing to have. Accidentally, I stumbled upon an exhibition of dance photographs by a man named John Austin called ‘Out of the Limelight’. I found myself fascinated by this because John said he wanted to photograph dancers because when he takes a photo, he is looking for perfection and he thought this was true of dancers also. Everyone in the dance community strives for perfection, however small the performance and even just in rehearsals, but not many people get to see this side of it all. John’s photographs not only show the pretty costumes and outstanding performance but the blood, sweat, tears and hard-work that goes on behind the scenes to create the picture that the outside world gets to see. When setting up the MPA50 exhibition at Radio Lancashire, I discovered an extraordin ary and beautiful project from the 1990’s. This was the Mughal Tent or the Shamiana – groups of local women joined together to create a banner, along with lots of other groups from around the UK, and the finished banners were put together in a tent at the Victoria and Albert museum in London. The finished product is exquisite and the level of hard work and attention to detail is obvious. In May 1996, there was a performance from the Abasindi Dancers and Drummers, they performed songs and dances from East, South and West Africa. From searching through the archive, I get the impression that the 90’s was a real decade of world culture for Mid Pennine Arts as it is the first time I can see events from around the globe and from people from different backgrounds and cultures. In the 2000’s MPA launched its largest project to date – Panopticons. Before, I arrived at the start of this two weeks, this project was the one I knew most about, as I have visited three of them on numerous occasions but still I decided to do a bit more research on them. 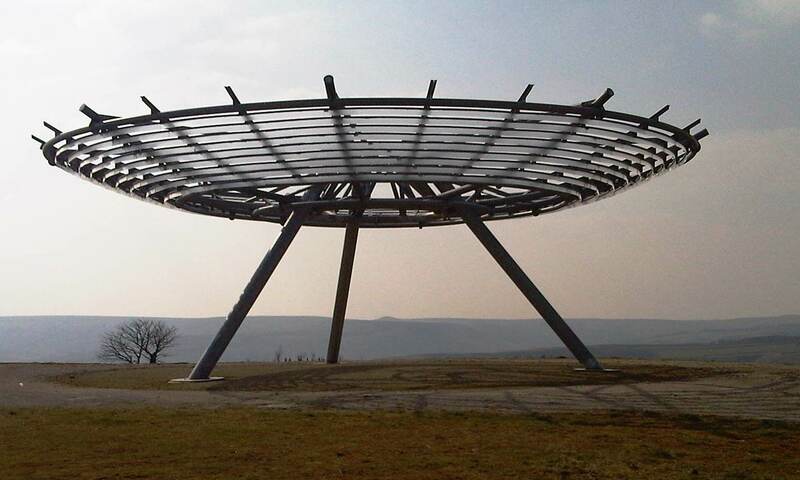 The project got its name from the word ‘Panopticon’ which means structure, space or device providing a comprehensive or panoramic view, all of the four Panopticons are placed high up, and the aim was to get people out into the countryside so that they could see the stunning views. Throughout the building of these, MPA managed to keep the community spirit alive by involving local people, schools and organisations as well as creating jobs and supporting businesses. One thing that definite ly shines through in all the projects is the community ethos of the company. 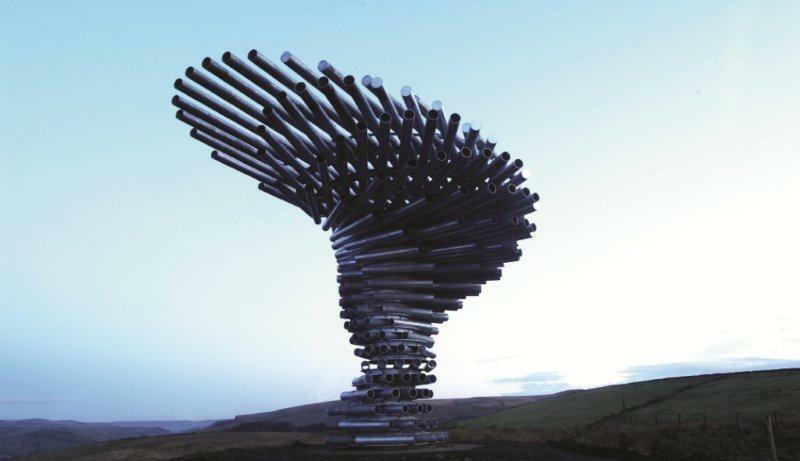 The Singing Ringing Tree is made from pipes of steel stacked in layers to make the shape of a tree in the wind; the wind blows across these tuned pipes to create a low, almost humming like song. 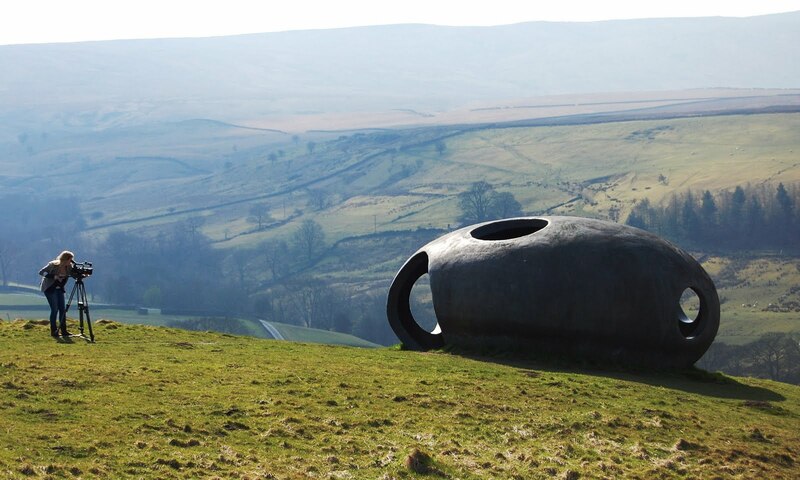 The Atom is located in historic Wycoller which can be dated back to 1000BC, the structure is constructed of Ferro-cement with a coating of metal-based paint. It can provide shelter but the circular cut outs also make great viewing spots for the surrounding scenery. 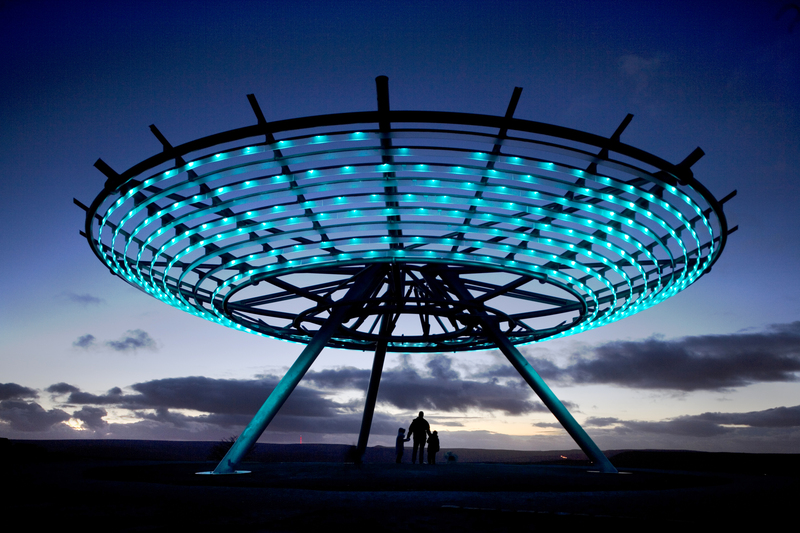 The Halo is a steel lattice structure suspended five metres above the ground on a steel tripod. It is situated above Haslingden on an old quarry and former landfill site. The Halo is lit at night and glows a dark blue colour, this makes it appear to be hovering over Lancashire and is clearly visible for miles around. Colourfields is the only Panopticon that I have not visited, so I wanted to find out some more about this one. It is a transformation of the cannon battery that was installed for the park’s opening in 1857 to house two Russian cannons captured during the Crimean War. Colourfields was built here to incorporate this piece of history, rather than it being dismantled and lost forever. It adds new dimensions of shape, height and colour to Blackburn’s Corporation Park and has fantastic views over to Lytham, Southport and Fleetwood. Before I arrived I was given some publications to read, one of which was about a project in 2014 called Truce. After reading about it, I was keen to find out more; Truce was all about commemorating the First World War, a topic I know quite a lot about through History and English. The project included: a performance about the Christmas Day truce from a local man’s perspective, a choir, made up of local vol unteers, who sang songs just like the soldiers did on Christmas Day, a textile piece made up of poppies made by local people and a young people’s football tournament- to commemorate the football game in No-Man’s Land. Again, this project involves all kinds of people and really brought people together to celebrate something that happened 100 years ago. Completely by chance, I found out that MPA was involved with t he redevelopment of the Coppice in Accrington; I’ve lived in Accrington virtually all my life and never knew who and what had actually gone on . There were talks and workshops in the allotments for the public and local primary school; a chance to think and put forward ideas for the further development of the area in the future and the Avenue Parade entrance to the park was completely restored by artist Michael Scheuermann along with the steps leading up to the monument at the top. Projects are constantly going on, sometimes right underneath our noses that we don’t know about or get involved in. I think this should be a lesson learnt to everyone that you should find out what’s happening and get involved in some fun activities and projects in your local area! 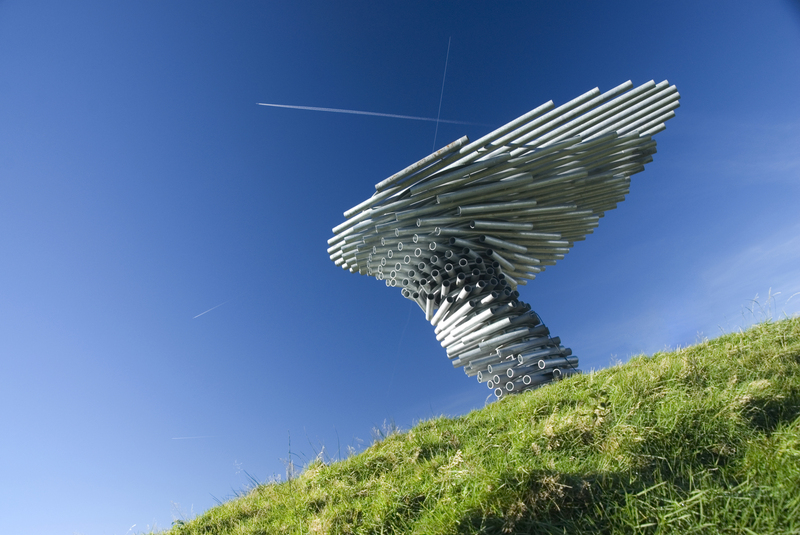 There are lots of videos on YouTube created by people who visited the Singing Ringing Tree, we thought we’d share some of them with you. If you would like to suggest any videos for this list please email: marketing@midpenninearts.org.uk with a link. Singing tree! Oh ringing tree! With the weather so variable, we thought we would share a variety of ideas for things to see and do this Easter. Helmshore Mills Textile Museum. Here you can soak up the atmosphere of the historic mills and witness original machinery at work as well as having fun and learning in an exceptional environment. The museum offers activities, events and special exhibitions, one of which is part of our Contemporary Heritage programme. 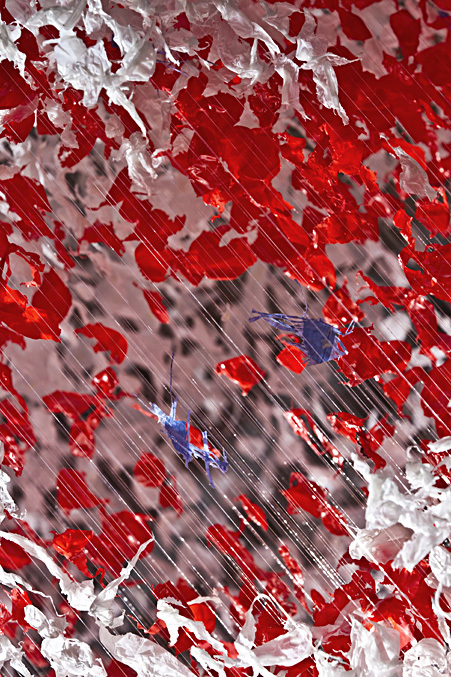 The spectacular No Match, created by international sculptor Claire Morgan, is a site specific installation inspired by Claire’s discoveries during her research residency in October 2011. See the museum’s website for details of opening times and entrance fees. Not to be missed! Clitheroe is a great day out at any time. Not only does it offer a large variety of unique and boutique shops there is also a fantastic selection of cafés, bars and restaurants to enjoy. There are many walks that begin in Clitheroe which you can find out more about here. Clitheroe Castle Keep is currently host to TAKEN, another of our Contemporary Heritage commissions. This sound installation by contemporary classical composer Ailís Ní Ríain is inspired by the story of the Lancashire witches. TAKEN allows the visitor to imagine how the 12 individuals may have felt during their last four months in captivity whilst awaiting trial. The Preston Greenway was constructed along the formerly disused railway line that formed part of the Bamber Bridge to Preston extension of the Lancashire and Yorkshire Railway. The greenway links Penwortham, Bamber Bridge and Preston city centre and forms part of the National Cycle Network. 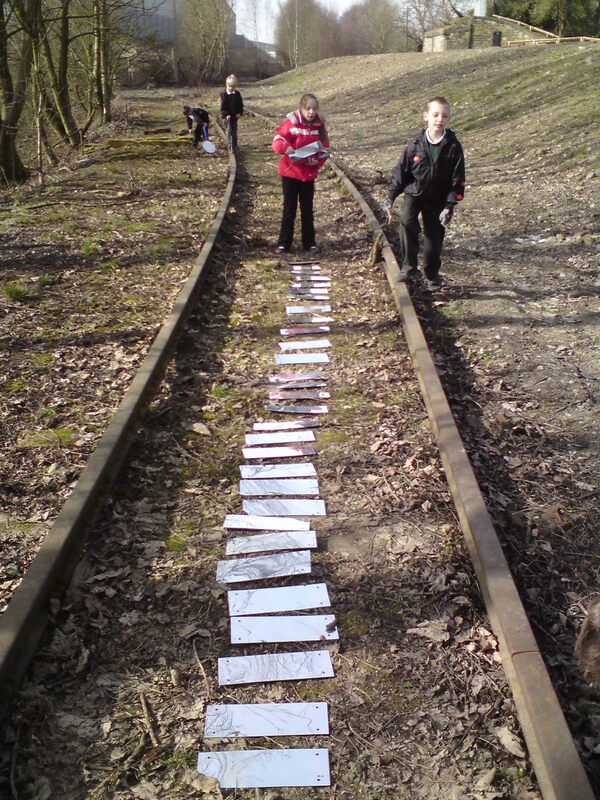 The Padiham Greenway was created on a disused railway line that runs between Rosegrove in Burnley and Padiham. The Padiham Greenway has been developed as part of a longer route between Great Harwood and Burnley which is designed to create an off-road trail that connects people to facilities and open spaces in and around the towns that flank the route. Have you visited the Panopticons yet? These iconic, contemporary landmarks were designed to attract visitors into the countryside to discover the stunning landscapes that Pennine Lancashire has to offer. There are four Panopticons each situated on a high-point site commanding spectacular views. For more information click here. You can also download various maps and guides for walking around the Panopticons and other areas of interest here. Have fun whatever you do! Don’t time fly! I hadn’t realised quite how swiftly, until the Christmas card from the Chief Exec of Burnley Council brought it to mind. The official municipal card was exploiting a suitably seasonal photo of the Tree in its Siberian winter setting, with a pile of presents sketched in around the base. This playful bit of graffiti might have been tailor-ma de to offend the impeccably minimalist design sensibilities of its creators, the inspired architect duo Tonkin Liu, but at MPA we are still inclined to be delighted whenever a Panopticon gets a bit of extra exposure. 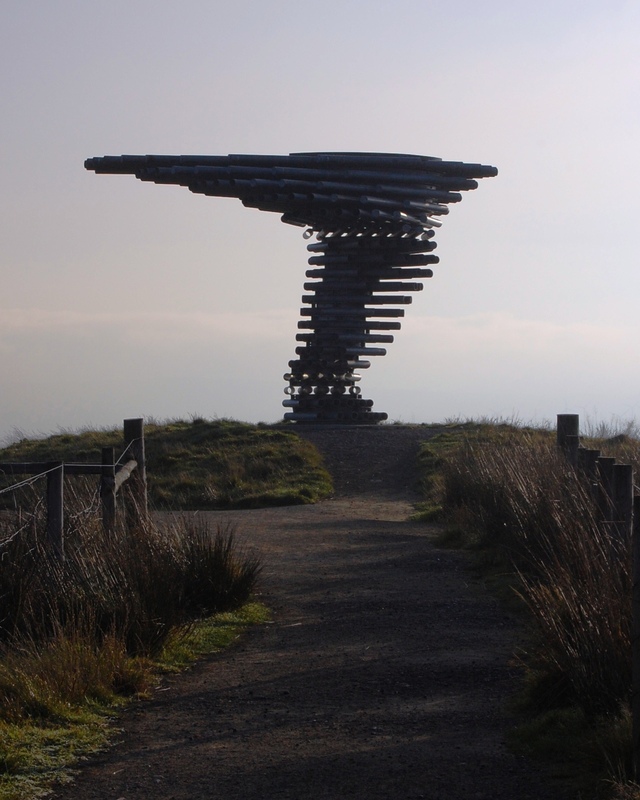 The Singing Ringing Tree was the third of the Panopticons series to be commissioned and built, in a very productive partnership with Burnley Borough Council. It was unveiled in December 2006, with two coachloads of special guests ferried up to the site and bent nearly double to keep their feet in the face of the howling gales. Back in the car park at Crown Point, the big executive coaches were rocking side to side as if about to capsize. But this delicate little landmark survived its crazy launch day, and has not looked back since. 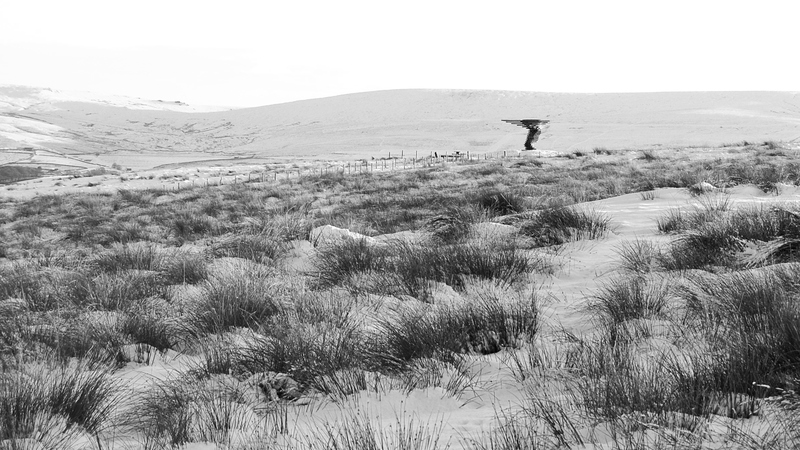 The Pan opticons project was intended to encourage folk to use the landscape on their doorsteps, to discover spectacular new views of Pennine Lancashire, and to explore further the rugged splendours of our area. More than this, it was designed to create positive images to project out into the wider world, and transform perceptions about our locale. 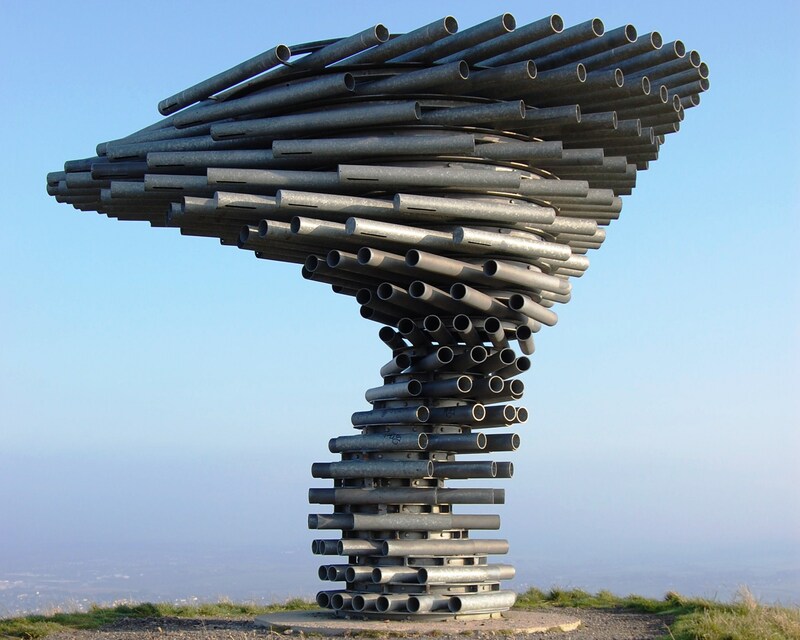 The Singing Ringing Tree has delivered on all of this, with knobs on. Burnley Council and people promoting Pennine Lancashire both make fulsome use of this very photogenic icon in all their promotional stuff. http://www.regeneratepl.co.uk/pennine-lancashire-location/about-the-region/. Images of the Tree have whizzed around the world. Millions of YouTube users have viewed viral videos of the Tree and its song. And this momentum is not slowing down. In 2011 we’ve had features of the Panopticons on two network TV shows – a lovely feature on Flog It! and another on Country Tracks. The Tree has featured in audio and image in the Berlin fashion mag Sleek and its covermount CD. And the new edition of our local OS map – guess what it has on the cover! This is the gift that keeps on giving. And what a gift it was. By happy coincidence, that launch day in December 2006 was also the 80th birthday of the Tree’s first benefactor, Sir Simon Towneley, who had identified the site, donated use of it, and worked tirelessly to help us locate the extra funds we needed. He also recruited our second benefactor, his son Peregrine Towneley, whose immensely generous contribution made it possible for us to balance the books and to complete this dream of a project. So happy 85th birthday Sir Simon, thanks again Peregrine, and here’s to the next half decade. With the New Year upon us, I thought it would be good to start with the top ten places I would like to visit this year. Having only managed to visit one of these last year, I am determined to tick these of my list in 2012. Ranging in prices, location and experience, this list provides a selection of outings to suit all tastes and budgets. A few do have end dates so make sure you visit those first! All these suggestions are suitable for adults and children alike. Clitheroe is great day out not only does it offer a large variety of unique and boutique shops there is also a fantastic selection of cafés, bars and restaurants to enjoy that well earned afternoon tea! There are many walks that begin in Clitheroe which you can find out more about here. 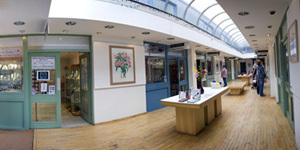 You will also find in Clitheroe, the Platform Gallery which provides a unique market place for handmade crafts from across the UK. You can visit the craft exhibitions, buy stunning gifts in the Craft Shop or take part in workshops and educational opportunities. For further information and opening times visit the website here. Clitheroe Castle Keep is also host to TAKEN, a sound installation by contemporary classical composer Ailís Ní Ríain. Inspired by the story of the Lancashire witches, TAKEN allows the visitor to imagine how the 12 individuals may have felt during their last four months in captivity whilst awaiting trial. December is an excellent time to visit with the cold, windy, icy weather adding to the experience. Find out more about TAKEN here and on our blog. Have you visited the Panopticons yet? Designed to attract visitors into the countryside to enjoy the stunning landscapes that this delightful area has to offer. There are four Panopticons altogether each situated on a high-point site commanding spectacular views. Colourfields, in Blackburn’s Corporation Park, allows you to enjoy a panoramic view of the park below, with the town beyond and distant views out towards Lytham, Southport and Fleetwood. 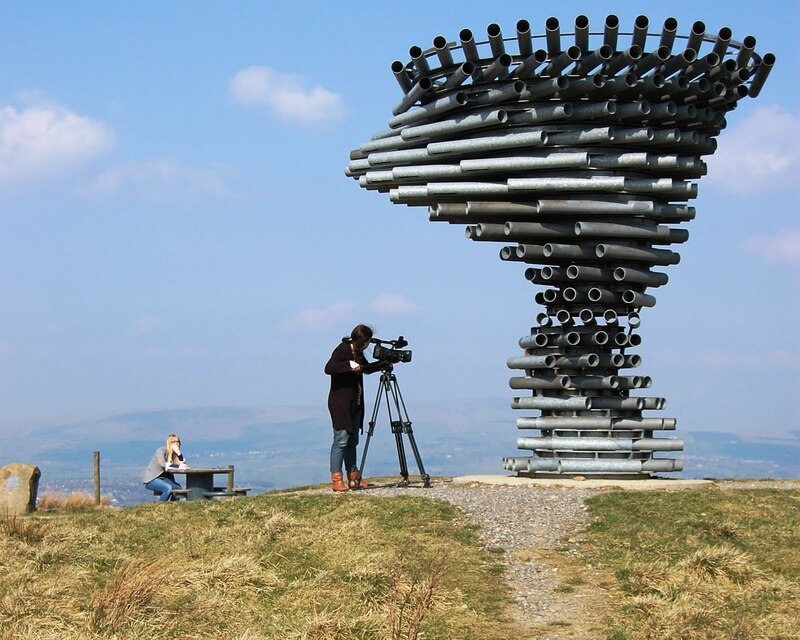 Singing Ringing Tree is situated on Crown Point above Burnley, look north for a superb view of Pendle Hill or east for a glimpse of the Cliviger wind turbines on the Yorkshire border. Atom, nestles on the hillside high above Wycoller village, there are breathtaking views of the Pendle landscape all around, including the historic settlement of Wycoller, now a conservation area. 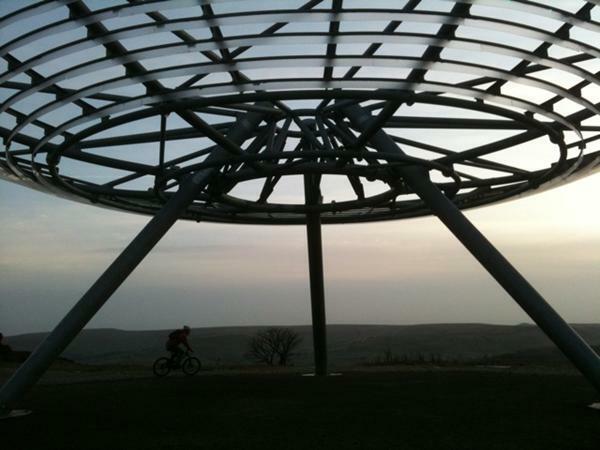 Halo is the centrepiece of a former landfill site on Top o’ Slate above Haslingden. You can enjoy commanding views of the Rossendale Valley, Greater Manchester and into Hyndburn, Burnley and Ribble Valley. The Greenways are perfect for an afternoon walk or cycle with the family; constructed along disused railway lines they provide a safe, beautiful and alternative way to discover the countryside. The Preston Greenway was constructed along the formally disused railway line that formed part of the Bamber Bridge to Preston extension o f the Lancashire and Yorkshire Railway. The greenway links Penwortham, Bamber Bridge and Preston City Centre and forms part of the National Cycle Network. The Padiham Greenway was created on a disused railway line that runs between Rosegrove and Padiham in Burnley. The Padiham Greenway has been developed as part of a longer route between Great Harwood and Burnley which is designed to create an off-road trail that connects people to facilities and open spaces in and around the towns that flank the route. 4. Chapel Gallery, Ormskirk via Burscough. The Chapel Gallery is situated in the lively town of Ormskirk. Their diverse programme brings some of the most inventive contemporary fine art and craft from across the UK to the region, while also supporting locally based artists in the development of their careers. There are plenty of activities to keep young minds absorbed and with an on site Café and Contemporary Craft Shop, the gallery is the perfect place to visit on a day out. Ormskirk itself offers a variety of shops and cafés and an afternoon can be easily spent wandering around the town. On route to Ormskirk why not stop off in Burscough and visit Gallery on the Wharf, the new permanent home for the Art and Craft Guild of Lancashire. As 2011 marks the silver anniversary of the Guild, the gallery opening in February makes it an exciting year for everyone. There is a wide variety of work on offer including ceramics, furniture, textiles, jewellery, glass, art, photography and turned wood from original designs all displayed in the unique setting of Burscough Wharf. Visit the website for more information. Brockholes is a new kind of nature reserve, an unreserved reserve owned and managed by The Wildlife Trust for Lancashire, Manchester and North Merseyside. 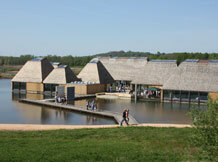 There’s lots to see and do at Brockholes, you can hunt out the floating Visitor Village which houses a restaurant, shops and Welcome Centre or explore the family-friendly hides, walking trails and play area. A fantastic free day out accessible by car and public transport. Visit the website for more information. See the Alice in Wonderland exhibition at Tate Liverpool till 29th January. The first exhibition of its kind to explore how Lewis Carroll’s stories have influenced the visual arts, inspiring generations of artists. The exhibition will provide insight into the creation of the novels and the inspiration they have provided for artists through the decades. Alice in Wonderland offers visitors a rare opportunity to view Carroll’s own drawings and photographs, alongside Victorian Alice memorabilia and John Tenniel’s preliminary drawings for the first edition of the novel. Find out the history of Preston’s Guild in 2012 with a visit to the recently refurbished Museum of Lancashire. They have a lot to offer and admission is completely free! Whether your interests lie in Preston or the wider heritage of Lancashire, the Museum of Lancashire gives you a great introduction to all things Lancashire. With displays, interactives and activities aimed at different ages, there really will be something for all of the family to enjoy. Why not top off your visit with a relaxing coffee and cake in our Gateway café. Cedar Farm nestling in bea utiful countryside is surprisingly situated just 15 minutes from junction 27 of the M6. Providing an inspirational and creative shopping experience, the wonderful array of unique shops, selling contemporary crafts, clothing, home furnishings and mystic gifts is complemented by a group of creative working artists; here visitors have an opportunity to purchase artwork made by some of the most talented people in the region. The cafe@cedarfarm, serves delicious freshly prepared food and the Coffee Roastery are both award winning places to eat and drink. With regular exhibitions, free parking, a children’s playground and farm animals to feed, it’s a perfect place to spend an hour or two. Although, if you want to spend longer, you can book onto one of the courses or have a pamper day at the beauty salon. With opportunities to feed the variety of animals and drop in to Pots of Fun to paint a pot, in between coffee and cake and wander round the unique shops, Cedar Farm makes a great afternoon out for the family or adults alike. The Valley of Stone is a project which celebrates the quarrying and stone working heritage of Rossendale. From the late 18th century to the time of the First World War quarrying was a major industry in Rossendale, employing thousands of men. The Valley of Stone project tells the story of this great industry, conserves remains, provides a programme of guided walks featuring Rossendale’s stone working heritage and celebrates this heritage through a number of arts-based activities. 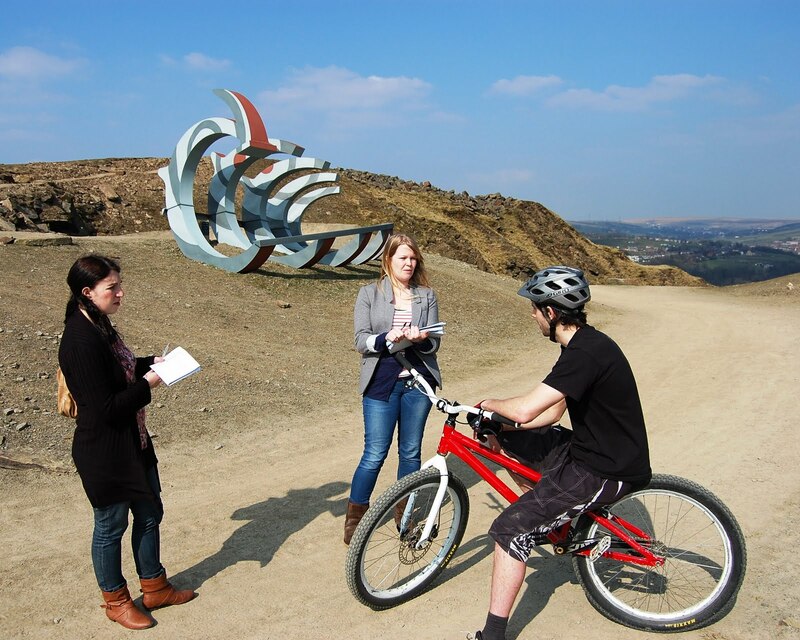 You can read more about Mid Pennine Arts’ involvement and the sculptures we commissioned in Lee Quarry here. Why not visit these sculptures and take the family and your bikes along for an active, cultural and historical day out all rolled into one! 10. BFG at the Dukes. 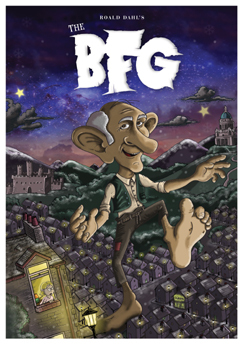 One of Roald Dahl’s most popular children’s stories, The BFG which follows the adventures of Sophie a little girl with a big heart and she’s going on a whizzpoppingly wonderful adventure this Christmas, as she meets the Big Friendly Giant and sets off on an unbelievable journey. From her sleepy orphanage, to magical Dream Country and beyond, join Sophie in this bra nd new production promising excitement, just a touch of danger and larger than life characters. In a faithful adaptation of the classic story, The Dukes brings this heartwarming tale of friendship and bravery to the stage with amazing puppetry, masses of fun and plenty of surprises along the way. Visit the Official Roald Dahl Website, which is packed with information and games as well as up to date news from the World of Roald Dahl. 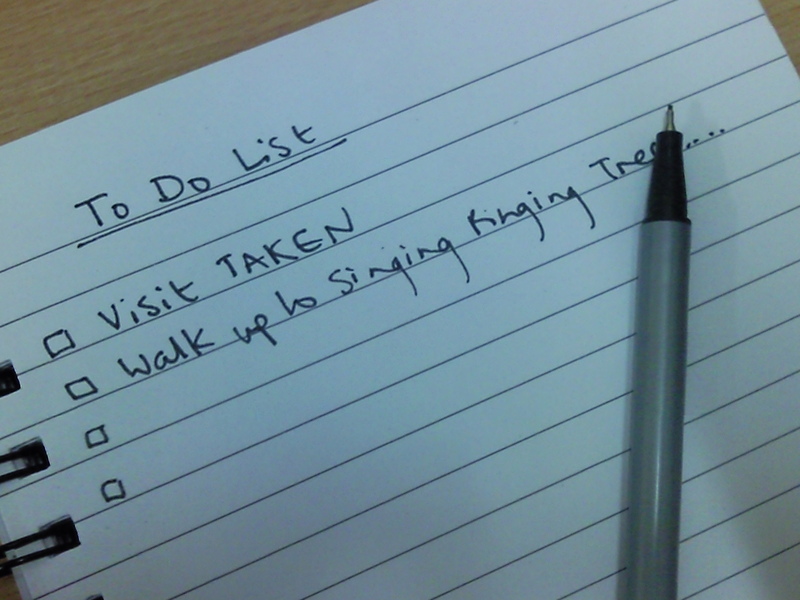 One of my many New Year resolutions is to organise more days out and actually do them – something I have been guilty of these last few years! Please let us know if you visit any of the above and what you thought by leaving your comments below. This BBC TV programme celebrates the British countryside. Recently the team visited Lancashire, on a journey from Fleetwood to Rawtenstall. 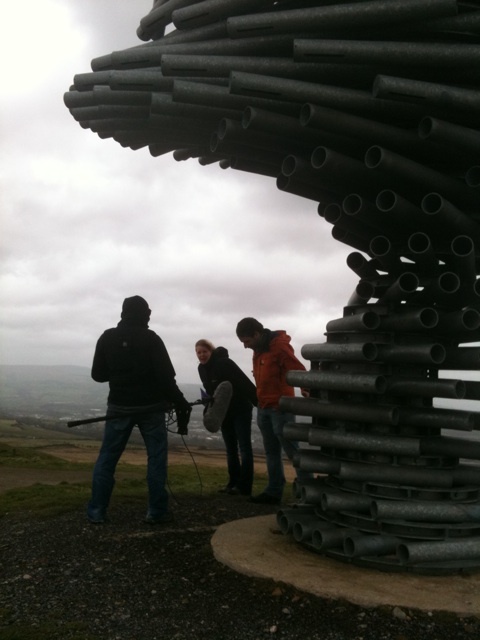 The journey included visits to three Panopticons, Atom in Pendle, Singing Ringing Tree in Burnley and Halo in Haslingden. 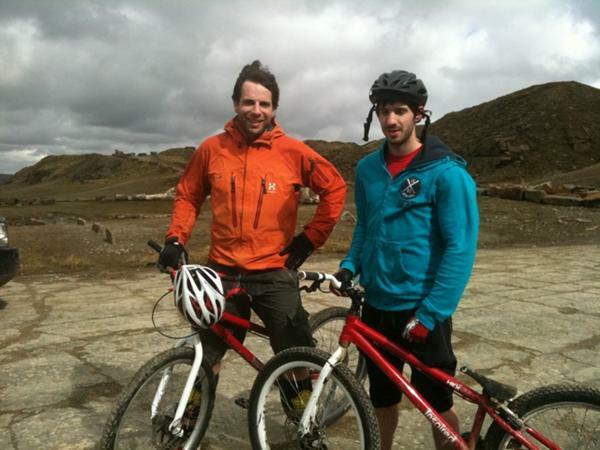 The theme of the programme was cycling, so they also took in the acclaimed Mountain Biking centre at Lee Quarry in Bacup. However on the day of the shoot, the wind howled and the rain fell! Mark was joined at Lee Quarry by top trials rider Ali Clarkson. Country Tracks in Lancashire will be on the BBC soon.